My day typically starts at 4am, so by 9:00 pm I’m tired. However, I often still have a long to-do I need to complete. Therefore before bedtime, I take a bath to relax, write another to-do list for the next day and read so that I will sleep through the night. 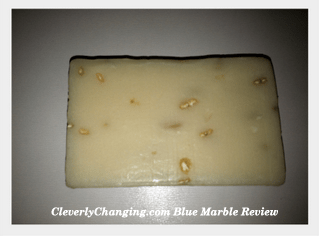 A couple of weeks ago I received the opportunity to try Blue Marble Body Care Botanical Soap Bar. The products are organic and safe from harmful toxins that many commercial soaps contain. The lavender and oatmeal bar became a soothing part of my night-time regiment. The soap was tantalizingly soothing. The scent was strong, yet pleasing. All of the ingredients were natural and organic. I have very sensitive skin and I was able to use it without any problems. I felt clean after using the bar, and no oily or sticky residue was let on my body. I have used it every night for about 2 weeks and I still have some of the bar left, so it is durable. It feels safe to use, unlike many products that contain ingredients I cannot pronounce. The soap did not dry out my skin. Overall, I felt reassured that what I was putting on my body, was healthy and I felt good knowing that it was also good for the environment as well. Would I recommend the Blue Marble’s Organic Lavendar & Oatmeal Soap Bar? Yes, the lavender oatmeal bar is strong so if you like the smell of soothing lavender this would be a great organic choice. Remember, that what you put on your skin often seeps within your skin so using this and other similar organic products is reassuring. Are you currently trying to make a shift with the products you put onto your body by going green and using organic products? You can also follow Blue Marble Body Care on Facebook and Twitter. Previous PostFaith Davis: A Woman Who Shines, Inspires, and Uplifts #WomenWhoShineNext Post Technology and our kids: How Plugged-in are they?